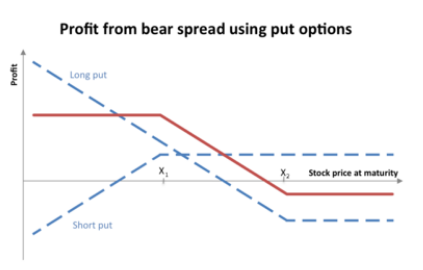 Bear Put Spread is a type of vertical spread wherein the trader buys a put option hoping to make a profit due to the market decline, and at the same time writes another put option with the same expiration date but with a lower strike price to balance some of the cost. Options trading is quite a complicated and confusing process. Experienced traders prefer trading with option strategies like spreads rather than trading naked options. 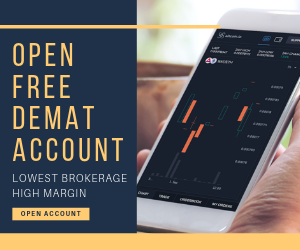 Although the spreads reduce the overall profitability of the trade, at the same time they also provide better visibility of the risks involved and can protect the trader from high risks. 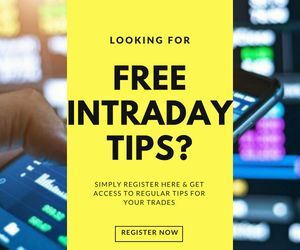 The new traders, who enter the trading world with the objective of making quick money, may not find the idea of limited profits appealing, however, for seasoned traders the visibility of the risks is more important than making high profits so that they can see where they are placed even if the trades go all in the wrong direction. One of the important spreads is the Bear Put Spread. As mentioned above, there is a difference in strike prices when it comes to this options strategy and due to the difference in strike prices, the net cost due to purchasing the put option with a higher strike price is reduced by selling the put option with a lower strike price. The lower the strike price of short put, more is the potential maximum profit, but of course, it comes with more risk as well. The construction of a bear put spread is buying an in-the-money put option and selling an out-of-money put option at a lower strike price. It is equivalent to a Bull Call Spread, but it is used when the traders have a moderately bearish forecast for the market and expect the prices to gradually go down. As is true with all the spreads, the gains are limited but so are the losses. If the prices fall as expected, the trader can make profits and limit his losses, but if the prices fall far more than expected then the trader won’t be able to make any profit. It is a trade-off between risk and reward. Also, just like the Bull Call Spread, the Bear Put Spread also has a net debit or requires a cash outlay at the beginning. Let us consider that Nifty Spot is at 6485 on March 23, 2018, and the ITM put option is at ₹6600 with a premium paid of ₹155 and the OTM put option is at ₹6400 with premium received of ₹63. When the bear put spread is set up, 6600 put option is bought by paying Rs 155 as premium and 6400 put option is sold by receiving ₹63 as premium. Thus, the net cash flow is ₹(63-155)= -₹92. If the market closes at 6800, which is more than the long put price and against the expectation of market going down, both put options will have zero intrinsic value and premium ₹155 is lost along with a gain of ₹63 in premium with an overall loss of ₹92. If the market closes at 6600, which is the price at which put options were bought, both put options will have zero intrinsic value and the total loss will again be ₹92. If the market closes at 6508, which is the halfway point between 6600 and 6400, the strategy will neither make money nor lose money. The 6600 put option will have an intrinsic value of ₹(6600-6508) = ₹92 and after paying a premium of ₹155, the net loss will be ₹(155-92) = ₹63 and not the total ₹155. The 6400 put option will expire without any value and will give a premium of ₹63. So the loss of ₹63 is offset by the premium of ₹63, making 6508 as the breakeven point of the transaction, with no profit and no loss. If the market closes at 6200, which is below the short put price, the intrinsic value of 6600 put option will be 6600-6200=400, and after paying a premium of 155, the net profit will be ₹245; and the intrinsic value of 6400 put option will be ₹(6400-6200) = ₹200 and a premium of ₹63 is received, making the net profit ₹(200-63) = 137, the total profit being ₹(245-137) = ₹108. The advantage is that the loss is limited to net debit of the transaction which is ₹(155-63)= ₹92. The drawback is that maximum profit is also capped at the difference between spread and net debt, which is ₹(200-92) = ₹108. This strategy makes a loss if the price moves above the breakeven point and makes a profit if the price moves below the breakeven point. 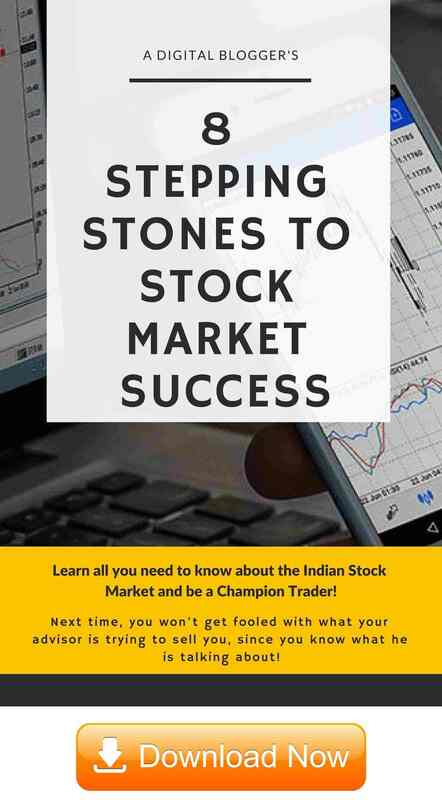 So, in case you are looking to gear up for the share market trading, and especially for derivatives trading – just fill in the details below.